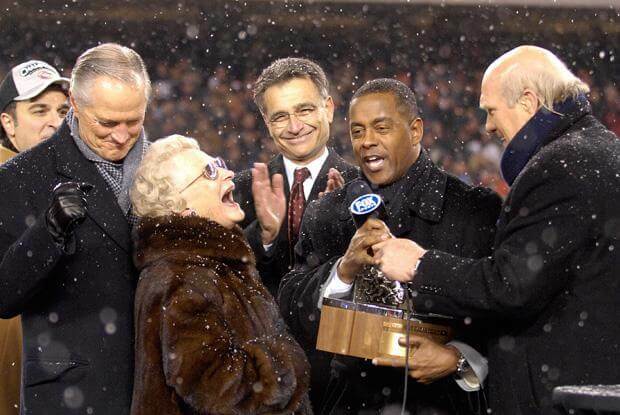 On November 1, 1983, a day after the death of George Halas, his oldest daughter, Virginia McCaskey, took over as the majority owner of the team. Her husband, Ed McCaskey, succeeded her father as the Chairman of the Board. Their son Michael became the third president in team history. Mrs. McCaskey holds the honorary title of “secretary of the board of directors”, but the 90 year old matriarch has been called the glue that holds the franchise together. Mrs. McCaskey’s reign as the owner of the Bears was not planned, as her father originally earmarked her brother, George “Mugs” Halas, Jr. as the heir apparent to the franchise. However, he died of a massive heart attack in 1979. Her impact on the team is well-noted as her own family has dubbed her “The First Lady of Sports”, and the Chicago Sun-Times has listed her as one of Chicago’s most powerful women.